Recently i have started to watch some of the old classic movies. This film on mob rule was a pet project of both star Henry Fonda and director William Wellman After a hard winter on the range, cowboys Gil Carter (Fonda) and Art Croft (Harry Morgan) ride into a fleabitten small town for a drink. Within minutes, they get mixed up in a barroom brawl, which earns them the animosity of the locals. By and by, word reaches town that a local rancher has been killed by rustlers. With the sheriff out of town, a lynch mob is formed under the leadership of Major Tetley (Frank Conroy), a former Confederate officer who hopes to recapture past glories. Worried that they'll be strung up, Carter and Croft reluctantly join the mob and head out of town. In the dark of night, the group comes across three sleeping transients: a farmer named Martin (Dana Andrews), a Mexican (Anthony Quinn), and a senile old man (Francis Ford). The fact that Martin carries no bill of sale written by the so-called murder victim is evidence enough for Tetley to demand that the three men be hanged on the spot. Carter knows that this is a gross miscarriage of justice, but he's helpless to intervene. Resolving himself to his fate, Martin gives Carter a letter to deliver to his wife. The three unfortunates die at the end of the rope, and the mob rides off, only to discover that there never was a murder of any kind. 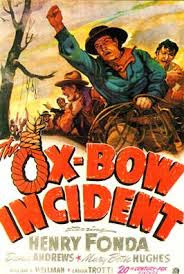 Based on a novel by Walter Van Tilburg Clark, The Ox-Bow Incident is not so much a western as a gothic melodrama, with deep, looming shadows and atmospheric underlighting worthy of The Cabinet of Dr. Caligari. The ending is as simple and powerful it can be. the ending is just the opposite of the starting where they return with something to give with something in mind. Even the dog which crossed their path in the starting went the other way.